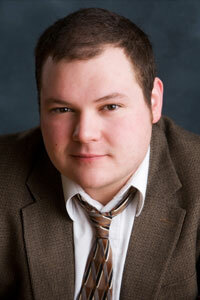 Scott Cagney is a New Jersey area actor with a BA in Theatre from Montclair State University. Scott is a Founding Member of StrangeDog Theatre and has performed in many of their productions, including: Buff -SubUrbia, Loudjack - Bootstraps, Ray -Spilling Stuff and Breaking Things, Lewis - Omnivores, Brian - The Virilogy, Mr. Person - Kitty Kitty Kitty, and Dog - Claire Went to France. Other credits: Kaffee - A Few Good Men, Bottom - A Midsummer Night's Dream, Larry - Anna Christie, Heinz - Clothes Encounters and Attention Span of a Fly(Paramount Theatre, Asbury Park, NJ). Scott has also worked numerous times with the Playwrights Theatre of New Jersey. In 2008 Scott was the recipient of the ACTF Region II Best Partner Award. He was also Artistic Director/ President of a student run theatre group, called Players, at Montclair State University for two years.